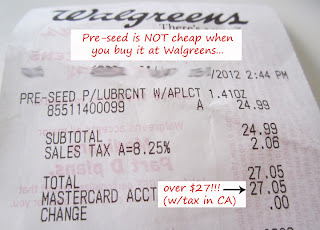 The other day I FINALLY was able to find some Pre-Seed in a drugstore - Walgreen's, of all places (they do not have it at Target or CVS - at least not in my neighborhood - though they used to carry it at CVS). This stuff is NOT CHEAP. The total for one (1) 1.4 ounce tube, with tax included, was $27.05. Which is equivalent to about $1.93 for every tenth of an ounce (less than one application), when you include the tax. First of all, I want to say - although the stuff is expensive, I know it's worth it, and I'm very grateful to Dr. Joanna Ellington for coming up with this stuff, and for figuring out that a substance called Arabinogalactan can actually help sperm survive longer than they normally would. She's a genius! That being said, however, there are people like me who are in our 40's, who have been trying to have a baby for several years, and have gone through a couple dozen tubes of this stuff. So in my opinion, some of us deserve a break in the price!!! Sadly, though, the baby gods don't really care about our poor TTC dilemmas - just like Aunty Flo doesn't really care about the fact that we chicks have to cough up extra money to buy feminine products every month, just because we're women. Men traditionally have to cough up money to pay for a first date. Who said that's fair? Life just isn't fair, period. So it's up to us to figure out our own ways to save money. My biggest Pre-Seed tip on how to save money: I mentioned this in an earlier post, but am going to mention it again in case you missed it. You can actually save money on Pre-Seed by combining it with Astroglide NATURAL. (you can get a free sample of Astroglide Natural by clicking here: http://www.astroglide.com/FreeSample.asp... just be sure to click the dropdown to select Astroglide natural, as the default is the regular Astroglide). If you want to buy a whole tube, you can find it here on Amazon. Yes, this really works. At least, it really worked for me (for anyone who has never read any of my other blog posts, I got pregnant at age 43, for the first time, after 5 years of TTC). I didn't use PreSeed in it's full-strength. I used a combination of half Pre-Seed , and half Astroglide NATURAL. Basically, I just dumped a tube of Pre-Seed into about half a bottle of Astroglide natural (It's true, I was doing a lot of other things to maximize my fertility, but wanted to mention again that I did not use Pre-Seed at its full strength). You can read about the other things I did, to get pregnant, by clicking HERE. I also want to note that, you can save even more money by ordering the 2.5 oz. tube of Pre-Seed (aka Pre') instead of the small (1.4 oz) tube. The larger tube is marked "for external use" but I found out the ingredients are the same, and the "external" Pre-Seed has the same concentration of arabinogalactan (the antioxidant that prolongs sperm life), as the small tube does! The smaller tube just costs more because you are getting the plastic applicators, but I have plenty of those and would rather have more product instead. You may have to order this product online, though. Walgreens only carried the smaller tube. UPDATE 10/11/14: Sorry ladies, it looks like they no longer carry the Pre'.... I think it's been discontinued. Bummer! When I combined the Pre-Seed with the Astroglide natural, it turned a kind of milky color, and stayed that way (I don't really understand why it did that, since both are clear when they come out of their respective bottle / tube). I did created more of the mixture the other day (photos below) and for some reason, it didn't stay that "milky color." But whatever the case - that's the stuff I used when I got pregnant. And I used a decent amount of it. I decided to take pictures when I combined the Pre-Seed with the Astroglide natural. It helps if you are working with a half a bottle. I had one almost-empty bottle, so I poured half the contents of my new bottle, into the old bottle, and then poured the pre-seed equally into both bottles, then shook them up. At first, you will see the "top layer" is milky looking, but when you shake it up, it turns clear. The first time I did this, it stayed a milky color, but this time it went back to clear. (eventually even the tiny bubbles - in this photo - disappeared, and it now looks clear). I also took a photo of the ingredients, which you can read here. Pre-Seed Ingredients: Purified water, Hydroxyethylcellulose, Pluronic, Sodium Chloride, Sodium Phosphate, Carbomer, Methylparaben, Sodium Hydroxide, Arabinogalactan, Potassium Phosphate, Propylparaben. Astroglide Natural Ingredients: Xylitol, Aloe Barbadensis Leaf Juice, Potassium ascorbyl tocopheryl phosphate (Vitamins C & E), Pectin, Anthemis Nobilis Flower Extract (Chamomile), Hydroxyethylcellulose, Phenoxyethanol. Here are the ingredients listed again, side by side, so you can compare (as you can see, Purified water and Hydroxyethylcellulose are the only 2 common ingredients). I'm no scientist, but most of the ingredients do sound pretty safe. Astroglide Natural Ingredients: Purified Water, Xylitol, Aloe Barbadensis Leaf Juice, Potassium ascorbyl tocopheryl phosphate (Vitamins C & E), Pectin, Anthemis Nobilis Flower Extract (Chamomile), Hydroxyethylcellulose, Phenoxyethanol. Preseed Ingredients: Purified water, Hydroxyethylcellulose, Pluronic, Sodium Chloride, Sodium Phosphate, Carbomer, Methylparaben, Sodium Hydroxide, Arabinogalactan, Potassium Phosphate, Propylparaben. 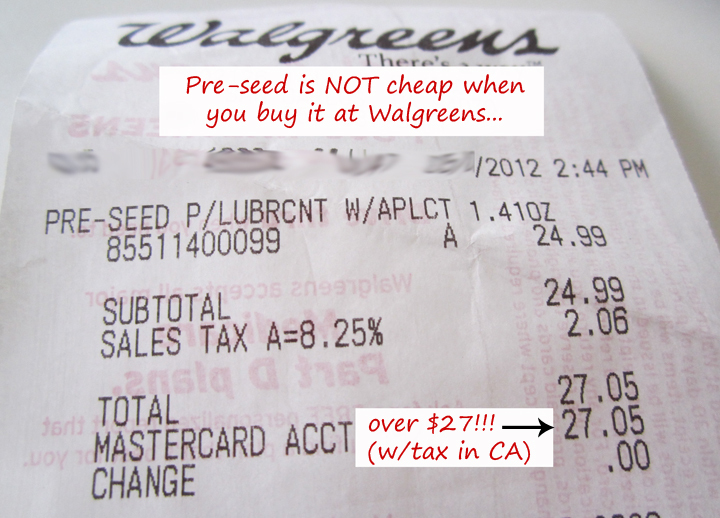 I went online to find the cheapest places to buy PreSeed. You can get one box through Amazon Prime (sold by the PreSeed company) HERE. Early-Pregnancy-Tests.com $21.50 (love these guys... they used to have the best pricing, but I just learned if you have Amazon Prime that is slightly cheaper): They do have FREE SHIPPING for this product in the US and Canada, even if all you're getting is this one box, PLUS they give you two free pregnancy tests with your order. http://www.early-pregnancy-tests.com/preseed-multi-use.html You can also buy the much larger tube - the pre-seed external type, for much the same price (it's twice as much product for about the same price: http://www.early-pregnancy-tests.com/preseed-external.html). I'm seriously thinking about selling this stuff myself... will let you know if I do! (I used to make my living selling on ebay, but took a break). Please check the main page for this blog site, and if I do start selling it, I will be sure to mention it on the main page. Maybe I could even throw in a sample of Visalus!